Silk Roof Lining, 9m x 9m Marquee Hire. All marquees have the option of being internally silk lined. The effect of silk lining a wedding marquee cannot be understated and it is a must if you wish to create a perfect and elegant setting. The price includes hire of roof and silk centre poles (if applicable) and installation in the marquee but not silk walls. 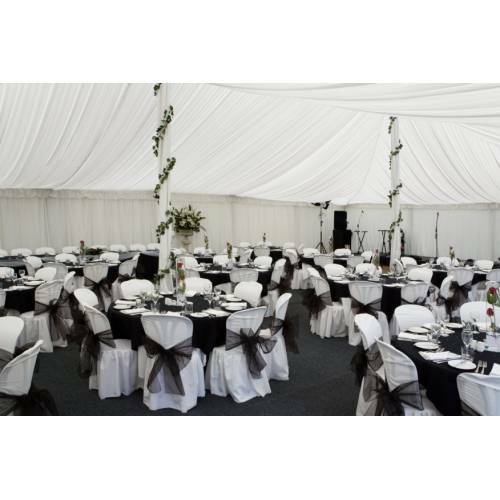 The best way to hire silk-liners with a marquee is via our Best Appearance Package. For photos, pricing and information on this wedding hire package please refer to Information (top menu bar) and then Marquee Information > Best Appearanance Package.